Guardians of the Galaxy Vol. 2 is a 2017 science fiction-action film and adventure comedy. It is written and directed by James Gunn and is produced by Marvel Studios. The film is based on the Marvel Comics title, Guardians of the Galaxy (2008), which was created by Dan Abnett and Andy Lanning, and is a sequel to the 2014 film, Guardians of the Galaxy. This second film finds the Guardians of the Galaxy trying to unravel the mystery of the origins of one of their own while evading an unhappy client intent on killing them. In 2014, Peter Quill/Star-Lord (Chris Pratt), Gamora (Zoe Saldana), Rocket (Bradley Cooper), Drax (Dave Bautista), Baby Groot (voice of Vin Diesel) are renowned throughout the galaxy as the Guardians of the Galaxy. They have been hired by Ayesha (Elizabeth Debicki), the leader of the Sovereign race, to stop a monster from stealing valuable batteries from the Sovereign world. That mission is successful, but also goes slightly awry, making the Guardians targets for destruction. While on the run, the Guardians meet a mysterious man, who calls himself Ego (Kurt Russell), and his assistant, Mantis (Pom Klementieff). Ego claims that he is Peter Quill's father, and he takes Peter, Gamora, and Drax with him to his home world. Rocket and Baby Groot find themselves stuck with Gamora's vengeful sister, Nebula (Karen Gillan). Things get worse when Peter's surrogate father and Ravager leader, Yondu Udonta (Michael Rooker), shows up to claim a bounty on the Guardians. Meanwhile, on Ego's planet, Gamora begins to suspect that there is something ominous about Peter's alleged biological father. The original Guardians of the Galaxy was one of the surprise hits of 2014, if not the surprise hit of the year. Although I was interested in a sequel to the film, I could not imagine what a Guardians of the Galaxy 2 would like. What we gets is Guardians of the Galaxy Vol. 2, a fun sci-fi action movie and a surprisingly thoughtful character melodrama. In Guardians of the Galaxy Vol. 2, the acting is really good; the special effects are impressive; the CGI-created environments, backdrops, sets (interiors and exteriors), spaceways, worlds, etc. are so dazzling in scope, color, and imagination. The songs on the soundtrack are just the inspired choices they were for the first film. The make-up and costumes are worthy of receiving Oscar nominations next year. But Guardians of the Galaxy Vol. 2 turns on the inventive and reflective storytelling of writer-director James Gunn. I thought that Gunn might be a potentially top-notch filmmaker when I saw his film Slither (2006), one of the few horror movies that is genuinely scary while also being droll and witty. And I have to admit that I also liked Scooby-Doo 2: Monsters Unleashed (2004), for which Gunn was the credited screenwriter, so that was also a point in his favor. With Guardians of the Galaxy Vol. 2, Gunn delivers his best screenplay. 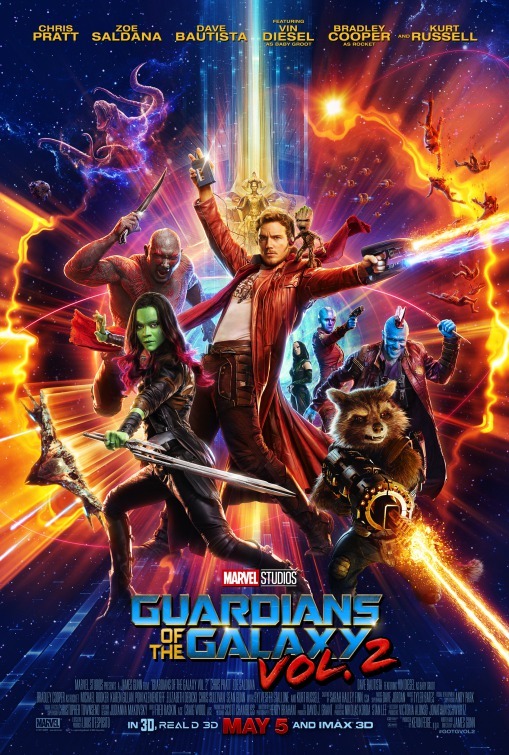 He takes what could have been a silly, frivolous, and mildly entertaining sequel to a surprising outer space, action-adventure film (the original Guardians of the Galaxy), and instead, delivers a shockingly moving rumination on what a family is, what it can be, and what forms it may take. Vol. 2 says that family members fight and yell at each other because they care so damn much about one another – even if each individual in the family is loathed to admit how much he cares about another family member and how much she cares about the family as a group. Guardians of the Galaxy Vol. 2 is just as wild and entertaining and out-there as the first movie. It is a science fiction/space fantasy pop confection with the delightful fizz of the first film. However, Guardians of the Galaxy Vol. 2 is not just a follow-up to a hit film, nor is it just the next installment in a franchise. 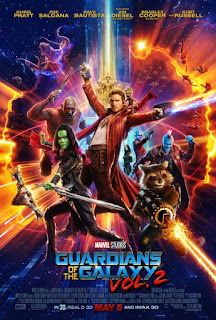 It is an evolution or at least it is evidence that this franchise can grow, and James Gunn is the guy with the notion that he could really, really improve on the original with a film that engages the characters – both the leads and the supporting players – in character drama and character development. I honestly wonder if Gunn can top himself in a third Guardians movie. The text is copyright © 2017 Leroy Douresseaux. All Rights Reserved. Contact this site for syndication rights and fees.